Situational awareness: The Dow Jones Industrial Average regained much of yesterday's losses, adding 306 points (1.26%). Go deeper. Getting a retail job isn't what it once was, putting unskilled workers at a severe disadvantage. 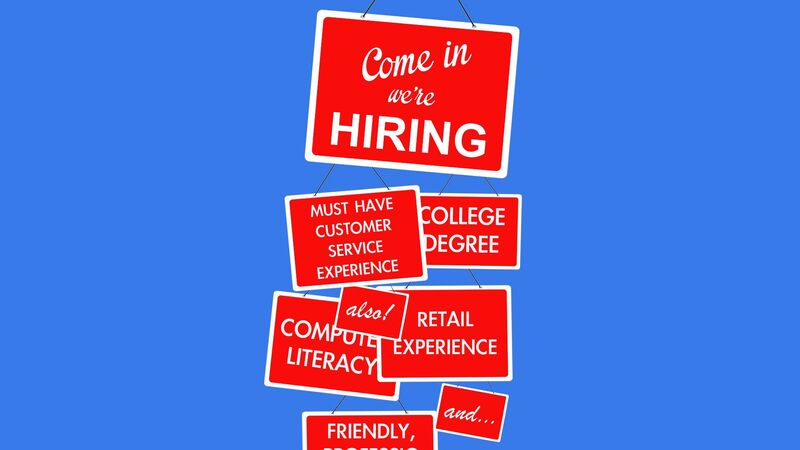 The big picture: The skills required to apply for entry-level retail work have gone up since 2010, according to a Burning Glass Technologies analysis for the AP. The analysis "found a greater emphasis on customer service and communications skills for cashier, stock clerk and sales floor support jobs," the AP's Anne D'Innocenzio reports. "And for many other entry-level jobs, employers want even more skills, like the ability to use customer relations software like Salesforce." "Even forklift operators are being asked to be proficient in inventory management software." Cashiers: "Employers asked for five skills in 2016, up from three in 2010." The alternatives: Cleaning and other service jobs that are more physically demanding and present less opportunity for upward growth. Why it matters: With corporate executives increasingly saying the era of broad-based wages is over — and millions of jobs on the verge of obsolescence— this is a real worry for workers who need to get their start. Quote“The bottom may be coming out of the career ladder." — Burning Glass CEO Matt Sigelman. Airbnb will be ready to go public next year, CEO Brian Chesky said Wednesday, though he's not sure it will. Go deeper. President Trump said in a tweetstorm today that he regrets picking Jeff Sessions as attorney general. Go deeper. ... Being Jeff Sessions. Israeli Prime Minister Benjamin Netanyahu presented the U.S. with Israel's demands and interests for any future deal between the U.S., Russia and Jordan in Southern Syria. Go deeper. There has been a 22% increase in migrant children in HHS custody from last month — 10,852 children are currently in shelters at 95% capacity, NBC News reports. Trump spoke out today about Roseanne Barr's firing, saying Disney CEO Bob Iger never called to apologize for negative statements ABC personalities made about Trump. Go deeper. 1 big trend: "At 3.6 billion, the number of Internet users has surpassed half the world’s population," says Mary Meeker's annual Internet Trends report. Go deeper. A prominent Russian journalist and Kremlin critic whose apparent assassination yesterday sparked an international outcry showed up very much alive at a news conference today, the AP reports. The backstory: Ukrainian authorities say the assassination reports were intended to "expose Russian agents," BBC's Joel Gunter reports, and an operation that took months to put together was conducted with Babchenko's cooperation. Quote"Special apologies to my wife. Olechka, I am sorry, but there were no options here."